Few days ago it felt again like it's time to refresh my hair. I have an event to go to in couple of weeks so I thought a fresh color would be kinda nice. 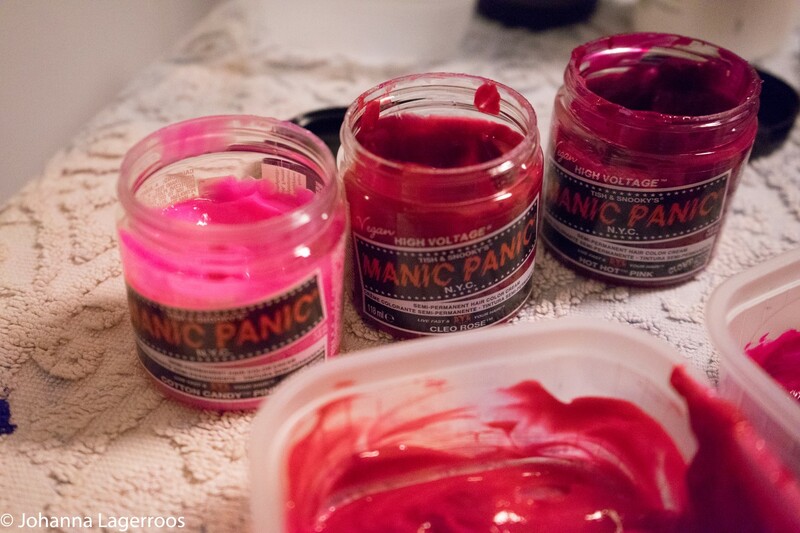 Once again I used Manic Panic colors, this time Cotton Candy Pink, Cleo Rose and Hot Hot Pink. 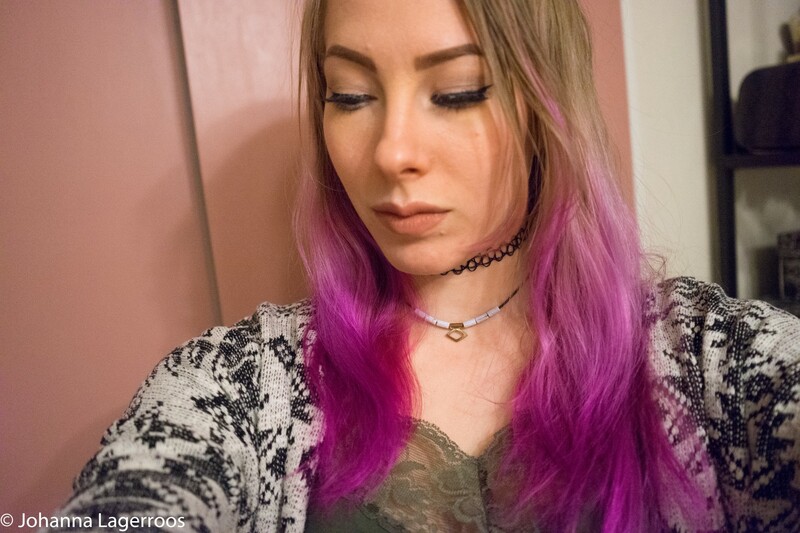 I love how easy it is to play with hair colors when you use Manic Panic, especially if you have very light hair. 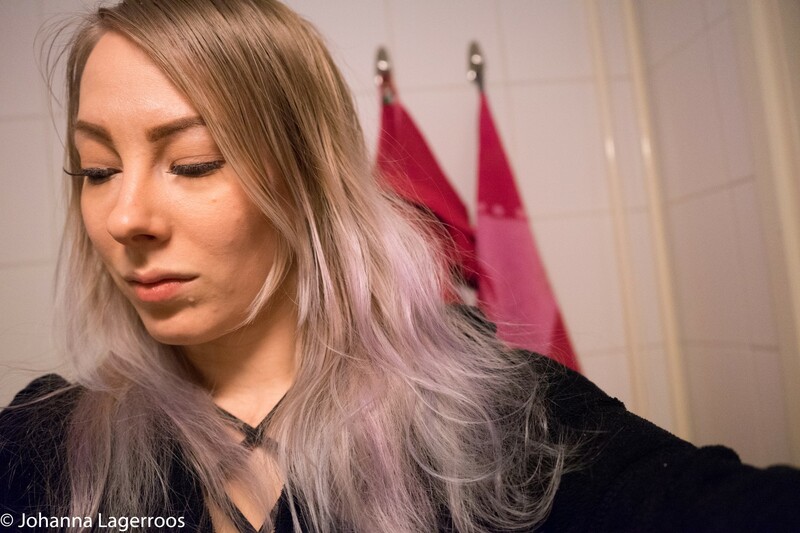 For me, it's so much fun that I can change my hair color at home but so that the color will fade out nicely and be gone - or mostly gone by the time I have appointment with my stylist. Who is understanding enough to encourage me to do the semi-permanent experiments at home, so thanks Jenni. We have agreed with her that the My Little Pony / Unicorn look goes well for me, and I'm so happy it's something I can also play with at home. As for most people, my hair is a way to express my personality and style. I'm lucky enough to have a job that allows having untraditional color to my hair and even though some guys make a bit of fun of it, it doesn't make me any less professional in their eyes. 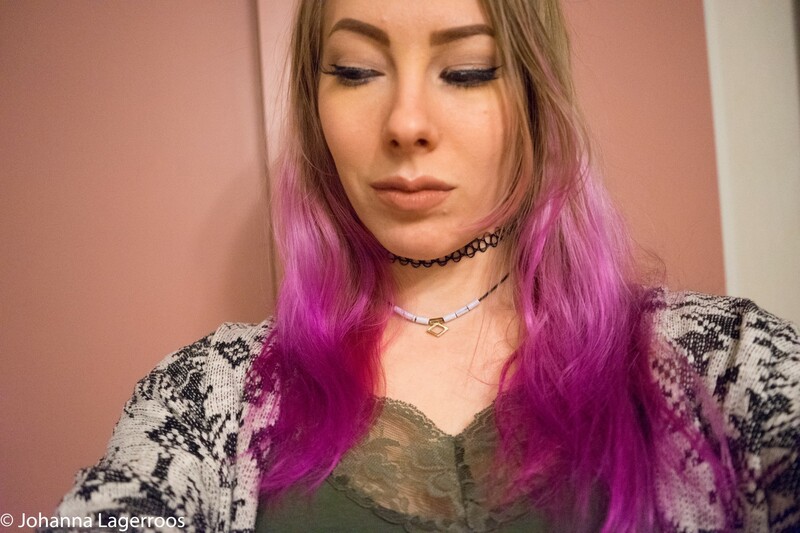 I would say that my hair color is important to me in the way that it should always look quite nice and rock chic, but I don't mind trying out new things and will give my stylist free hands on picking the new shade for my ends. She knows what I like and what suits me. I'm literally the girl that went to a new hairdresser to get a completely new kind of color few days before her wedding. Because even though my hair is important to me, I'm ready to rock any look I'm given at hairdresser's. That's why I'm so prone to try new colors at home as well. I crave a little change and/or refreshing from time to time, and at-home coloring is a great way to do that. And at least with semi-permanent colors, it's easy to do without the commitment. Although because all the hair stylists out there that have to repair box-color damage all the time, I would always recommend consulting someone who has experience with haircolors before trying a drastically new shade on you. This coming from a girl that has been burning her hair with box bleach, dyed over it with light brown and getting a result that was borderline green because I didn't know how certain colors react together. Luckily my stylist back then knew how to fix it. So do try things at home, but don't be afraid to get advice from the people who know more. 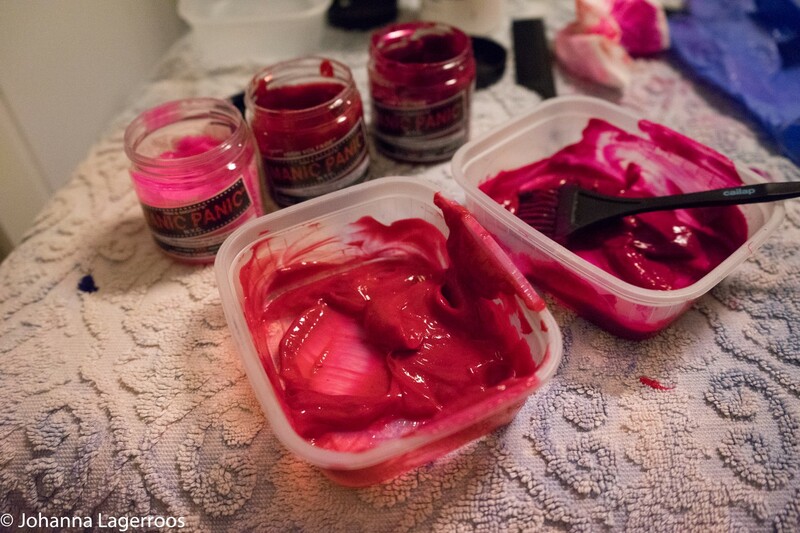 ...and to turn it into a bright pink/fuchsia ombre. I think I did quite nicely, like I mentioned before the Manic Panic colors are easy to use and perfect for my needs. But, if you'd like a more natural color done at home, there are ways to do that. For example a service called eSalon. Their mission is to inspire, educate and guide their customers to complete color happiness. They have a personalized service with which they help you to find the perfect color for your needs, by taking in consideration your hair history. That is fantastic compared to randomly picking a box color by yourself and hoping for the best. And what more, they ship your custom color to your door so it's many ways easier than going to buy your hair color. Their Made For You Custom Hair Color has been praised by Allure, and I actually checked out some YouTube reviews about them in which the ladies seemed very happy about the service. You can get your color by filling a profile on their website (which is super simple, I tested), and based on that, they will help you find the perfect color. You can also send them pictures to help figure out the correct match for you. The infographic doesn't quite cover my color since I'm an avid user of shock colors, but if I didn't color my ends with pinks and purples, I'd be a blonde. So we'll go with that. It's my natural color and one I've loved most times (except a brief period in my teen years when I went for a reddish light brown). I'd say the description actually is somewhat on point with me, I try my best to be all those things in my daily life, and youthful I'm so much so that I get carded everywhere because I apparently don't look my age (which is 27). As for my shock colors, I hope they a little story of me being rock chic at heart and open to new experiences. And that I really like bright colors. What does your color say about you? Let me know in the comments below! That's all for today's post, I hope this was fun for you as it was for me since I got to dye my hair and all. I'm actually hoping to get another post up on Sunday despite what I said in previous post, because I have quite a bit to post about at the moment. So stay tuned for that and follow me on Instagram for more updates (I'm @silvertigo). I'll see you again soon!